Obesity has become a huge problem in most developed countries. According to the World Health Organization, the number of obese people has more than doubled since 1980. Why is obesity such a serious health issue? The leading causes of death (heart disease, stroke and certain types of cancer) correlate with the high body mass index. Children are seriously affected too: the number of obese children has risen from 32 million in 1990 to 42 million in 2013 (more than 30 percent). This is the reason why we can’t take obesity lightly. What has caused such increase? Experts mostly blame on eating junk food and the lack of physical exercise. Most moms and dads lost battle with bad nutrition and lots of them are obese themselves. This is why we as parents need to teach our kids healthy lifestyle choices and take responsibility for the eating habits of our children as soon as possible. Here are five good ways to start. Sometimes, becoming aware of the horrible statistics mentioned above is enough to wake up and decide to change your way of life for the better. Most of us moms will, when reading such facts, become worried about our kids’ health and we’ll become inspired to change their eating habits. It’s important to realize that it’s our job to make our children eat healthy and to get rid of junk food from the menu. Only when you fully decide to take responsibility for your family’s health, you can start with some concrete steps towards protecting your kids from junk food. Before you inspire healthy eating habits, try to teach your kids some basics of nutrition. Instead of labeling food as bad and good, try to explain why they are “bad”. Teach them that calcium in milk and vitamin C in oranges and lemons are good for their bones and immune system. Explain what will happen if all they eat is pizza or chocolate. If you simply label food as bad or scorn them for eating junk food under-the-table, you won’t achieve the desired effect. There are better and more fun ways to teach your kids good nutrition choices. How to make children love good food and how to make the whole cooking/eating process more interesting? It’s simple – take the kids to the grocery store and teach them how to select good produce. Ask them to come to the kitchen while you’re preparing tasty snacks or ask them to help you. Don’t forget to skip possibly the most important step – family dinners. Don’t eat in front of TV, always eat together and create a wonderful family routine. This will not only make your kids enjoy their meal slowly and without disturbances, but it will also create a strong bond between family members. Usually, kids eat what their parents eat. 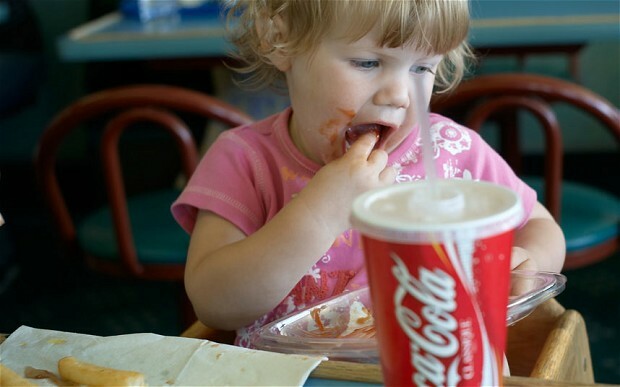 It sounds harsh, but this means that parents are to blame for the kids’ unhealthy diet. However, this means that kids will pick up all our good habits too. If you’re eating an apple to satisfy your sweet tooth, don’t be surprised if your kids join you. Monkey see, monkey do. If we observe people with good habits, we are more likely to adopt them. If you gorge on pizza on a daily basis or eat a bucket of ice cream, don’t expect your kids to lead a healthier life. Of course, your kids are not exact copies of you, but being a good role model will certainly increase the chance of teaching them the good nutrition habits. The last, but not the least important advice – don’t expect immediate change. Sometimes, it takes more time to see the fruits of your labor. Try to reward your kids with praise when they choose a healthy snack. Avoid nagging and punishing them – just redirect them to a healthier option instead. Just be patient and the results of your common work will be visible. Also, be aware that your kids are social creatures and their friends have a significant influence on them. Therefore, it’s perfectly fine if you allow your children a slice of pizza once in awhile or a piece of their friend’s birthday cake! Great tips on good eating habits.